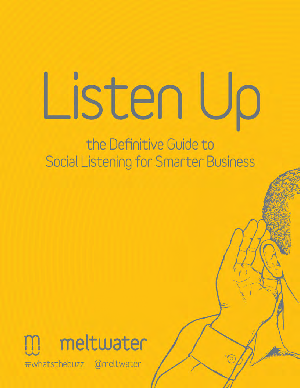 Social listening is the most significant technology to hit marketing since social media itself. But marketing isn’t the only department that can utilize social listening: your entire business organization can use social listening to inform its programs, products and business decisions. This free social media monitoring e-book will help you take your marketing to the next level by enabling informed, data-driven business decisions. Download this definitive social listening guide and learn how to utilize a good social listening tool across your business organization.